NOTE: Please ensure to have a survey carried out by a qualified Gas Safe engineer to check and certify the compatibility of your chimney with this fire before making any purchase to avoid disappointment. Note: The delivery service offered on this product is based on a one man, kerbside, only delivery. Due to the nature and weight of this product, you will need to arrange additional assistance to offload the goods from the vehicle when it arrives at your delivery address. The goods are delivered on a pallet normally by a large commercial vehicle in excess of 7.5 tonnes or more so please ensure to advise us in writing by email if your property has any difficulties with access once you have placed your order so alternative arrangements can be made to avoid incurring additional costs in the event a delivery cannot be made if the vehicle cannot deliver safely to your location. This type of fireplace comes in several pieces and each and every piece of the fireplace will need to be fully inspected on delivery before signing for the goods to say they has been received in good condition as per our terms & conditions. When you receive a Stone fireplace most are crated up/palletised deliveries and as you look at each piece of the fireplace you will see that there are many areas of the fireplace which are unfinished that may have chips, scratches, glue residue etc. Do not be alarmed as these are non-cosmetic parts of the fireplace which will not be seen once installed which is quite normal and to be expected so should not cause any reason for concern. Your primary concern should always be to check/ensure the outer finished cosmetic parts of the fireplace which will be on show once installed are all received in good condition. Stone fireplaces of this type do not come with fitting instructions as they are not a DIY product rather a fireplace which needs to be installed by an experienced/qualified fireplace installer who would know how this fireplace fits together based on past experience. 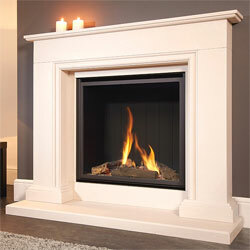 A Gas Safe Registered fireplace installer would also be needed if installing a stone fireplace with a gas fire.